A professional marine artist who works in a studio/gallery at Royal Clarence Yard, (aka Royal Clarence Marina) Gosport, Hampshire. He has had many one man and joint exhibitions in England, Germany and Belgium. He has exhibited at the London Watercolour Drawing's Fair, Kensington Fine Art Fair, Affordable Art Fairs in London, Bristol, Edinburgh and Amsterdam and with the Royal Society of Marine Artists at the Mall Galleries, London and also a private exhibition for HMY Britannia. His work may be found in numerous private, public and even royal collections, including local museums, the Royal Yacht Squadron at Cowes and the German Maritime Museum at Bremerhaven. Working mainly in watercolours in a self taught style his detailed paintings are the result of many hours of research and knowledge of old working craft. He has been a mate of a Thames sailing barge and a gaff schooner and has also participated in the Tall Ship's Races, for whom he has painted presentation paintings and done designs for many trophies. Colin also creates works of art in driftwood and objects found whilst beachcombing such as harbour quaysides with cottages, pubs and fishing boats. Also lighthouses which are gilded with 23 carat goldleaf to make them shine. Colin will accept commissions on most maritime subjects. 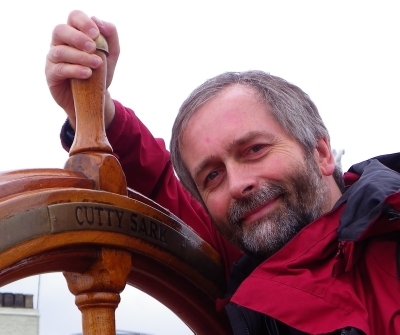 He specialises in old working sail, J-Class yachts, Tall Ships, Portsmouth Harbour views, Royal Yachts and Lighthouses including his Chartworks painted on old Admiralty Charts. Naval commissions have included, the current flagship, HMS Bulwark, HMS Turbulent, HMS Gloucester, HMS Endurance, HMS Trafalgar and the type 45 HMS Diamond. For further information and for all commissions call his studio 02392 525014, email colinmbaxter@hotmail.co.uk or visit his studio/gallery: The Driftwood Studio, Unit 2A, North Meadow, Royal Clarence Yard, Weevil Lane, Gosport, Hants. PO12 1BP.